Registration includes meals and snacks during the retreat but not accommodations. There are many affordable hotels close by. If you would like to request a host home or a scholarship, please email us. The registration cost includes meals and snacks during the retreat. Breakfast, Lunch and Dinner will be provided on Thursday and Friday. Breakfast and snacks will be provided on Saturday. Housing is not included in the registration cost. Who should come to the retreat? 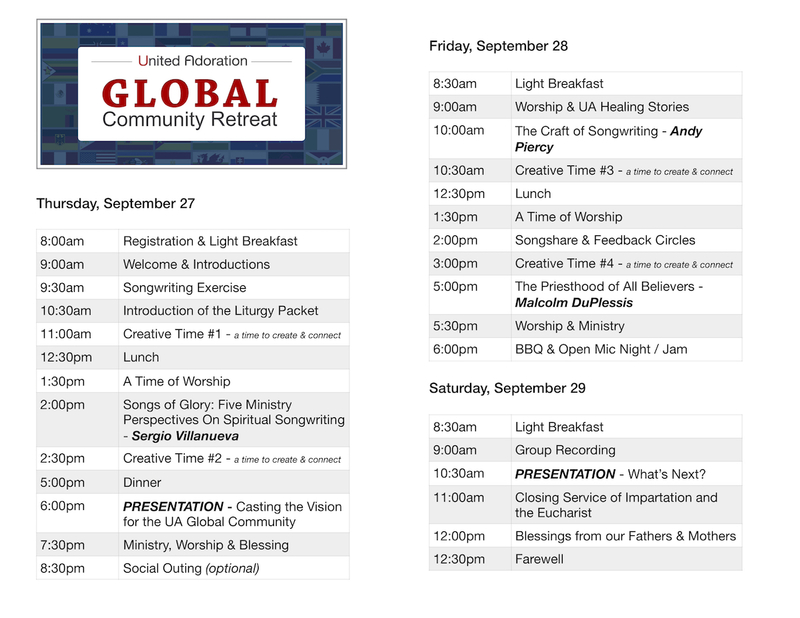 The UA Global Community Retreat is for EVERYONE! Our retreats are for people from all generations and all skill levels. Whether you’re just beginning to write, you’re a professional writer or you’ve never written yet… this retreat is for you! What kind of music will be written at the retreat? At United Adoration, we view new songs as fruit of a deeper work. Our retreats are run in such a way as to curate a spiritually refreshing and collaborative environment where the Holy Spirit is moving to connect people as they engage in the creative process. We do not have a pre-determined goal of what kind of music will come out of our retreats. We believe the Holy Spirit will use each and every person at the retreat to add their own style and gifting. Do I write by myself or with somebody? Both! The majority of the retreat will be Creative Time. These creative times allow organic times of writing and collaboration to happen. You are free to write by yourself, with a group or both! Write songs. Build friendships. Forge partnerships. Unleash creativity. Enjoy God’s presence. Eat good food. Fuel vision. Get recharged. Be encouraged. Minister passionately. The UA Global retreat is truly a unique opportunity. It’s not a conference or a seminar, it’s a sacred experience. For 3 days, people from around the world will gather together in a space we set aside to minister to the Lord through writing songs of worship, build relationships with like-hearted brothers and sisters, and be encouraged by spiritual fathers and mothers who want to build up a generation of songwriters. It will also be a time to hear stories of healing from some UA community members, and hear the vision for UA’s future. We are working hard to create a restful, creative, and sacred space and retreat schedule to allow the Lord to minister to us as we minister to Him. Heartland Church has many creative spaces carved throughout the building that will allow you and others to collaborate on songs during Creative Times. We will have several keyboards set up throughout the church and a few guitars on hand; however, we encourage you, if you are able, to bring the instrument you feel most comfortable with you to the retreat. Don’t worry, we will have a packet to help jump start your creativity here when you arrive! We will also offer Song Shares throughout the retreat where you can give and receive encouraging and helpful feedback for the songs you’re working on. As relationships and partnerships form, it’s important to share meals together as well. So, lunch and dinner (as well as tea, coffee, and snacks) will be covered as part of the retreat cost. And as with most of our retreats, we will have optional, built in outings in the evenings to connect with fellow attendees. And of course, we don’t want to neglect our sacred time with God. There will be several times throughout the retreat where we will have services of ministry and worship. In fact, the end of our time together will culminate in a precious worship time of coming to the table of the Lord, and being encouraged by our spiritual fathers and mothers.